For those companies that are manufacturing large format digital graphics in their own shops, MarketKING offers educational products which will help you avoid the pitfalls you may come across, and give you the knowledge to produce better and more successful graphics. MarketKING is considered to be one of the best companies in America known for large format graphics. We use the word "experience" because we have designed, printed and installed actual jobs, and know what goes into each one. When you review our portfolio page and you see our owner, David King, literally hanging from buildings (and even the Coke bottles at Fenway Park in Boston, MA), you can clearly see that David knows first-hand about this market. As you peruse our website, you will see the hundreds of other jobs that he and his team have designed, created, and implemented over the years, and you can feel confident knowing you have chosen the right company for your project. David's experience is so extensive that he is considered an “industry expert,” so much so that he has been one of the top writers for Digital Graphics & Sign Business Magazine (now the new Sign & Digital Graphics magazine) for over 7 years; additionally, David speaks at many trade shows each year. Offering you our 25 + years experience in design, advertising, marketing and sales, we've developed an acute taste for what works, and doesn't work. We have the design team, experience and resources to ensure you we can get your project done on time and with the best products and services available. 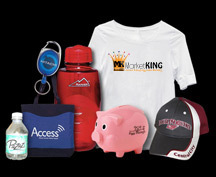 Whether it's a full marketing program, a direct mail campaign, a set of business cards, and all the way to a full line of print, apparel, and promotional products, MarketKING is the company you can trust to return you the best results! Promotional items are in most cases an expense - we do not look at these items this way, we look at your event, what you want to achieve from the event and we tailor the promotional product to the goal. This way we can project a return on your investment for the promotion. Keep in mind most promotional items cost much less then the actual promotion, be that a trade show, event or a hand out for the sales people. Your budget is important to us and we will do everything we can to keep your items within your allowance.